Hello from the Travelerintransit. 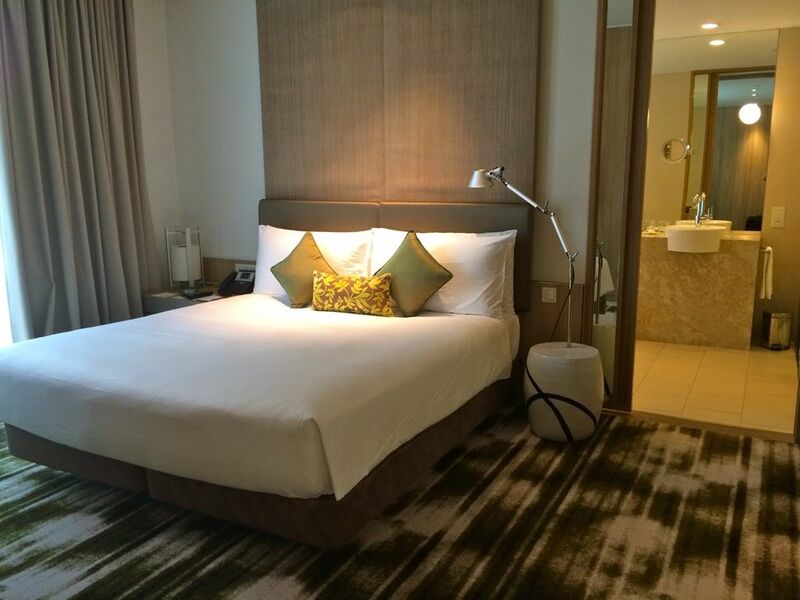 I promised a report on my weekend staycation at Crowne Plaza Changi Airport so here it is! Honestly the weekend flew by so quickly because S and i were both feeling so relaxed in the tropical resort environment of the hotel and before i knew it we had to check out. BAH. Anyway take a look at what Crowne Plaza has to offer! And really, it's the best transit hotel ever. 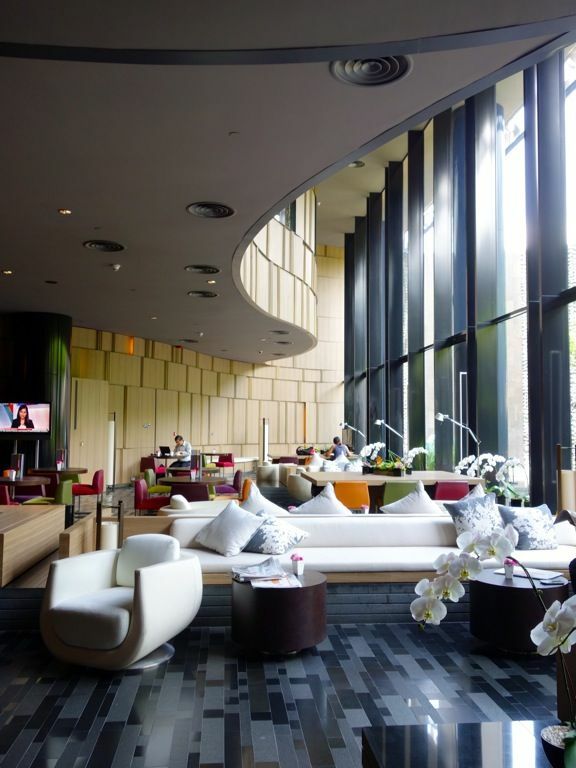 Crowne Plaza Changi Airport takes on a Contemporary Asia theme which focuses a lot on the tropics. There are plenty of open and green spaces which remove all that strain from traveling (and work in our case). 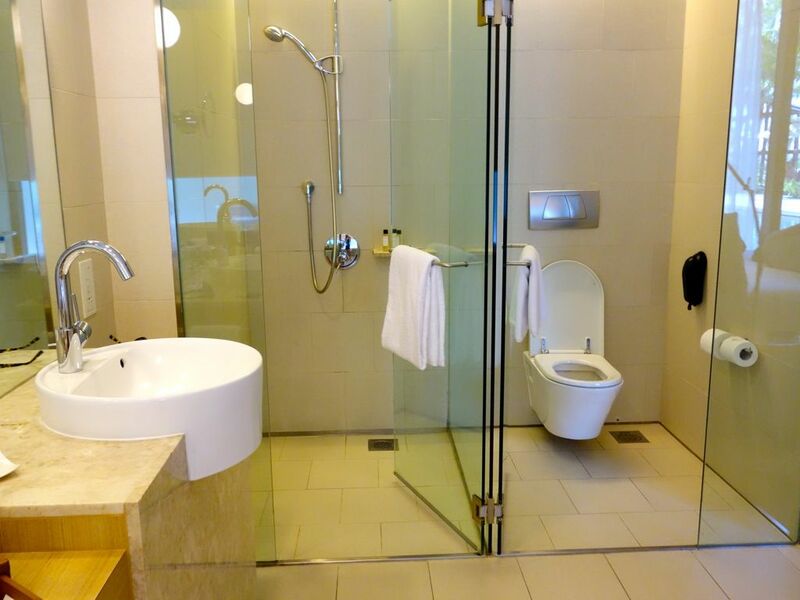 I couldn't believe we were in an airport hotel when i stepped into our 75sqm King Suite. Boy the space was huge. Love the huge windows that allow natural light to flood the room in the day. I love the soothing colors of the room and it's really similar to the new leather upholstery of my favorite carrier Singapore Airlines. The typical deluxe rooms are 36sqm and all rooms come with a 1.8m work desk and an iPod docking station. The rooms function equally as a space to rest and recuperate or as a working space for the travelling executive. The difference with the Suite is that there's an additional living area, everything else is the same. I cannot believe that all the rooms come equipped with a bathtub. That's sheer luxury for city hotels and it's big enough for 2! Wink wink. There's also a separate standing rain shower. Love the refreshing citrusy scent of the bath products from The White Company. 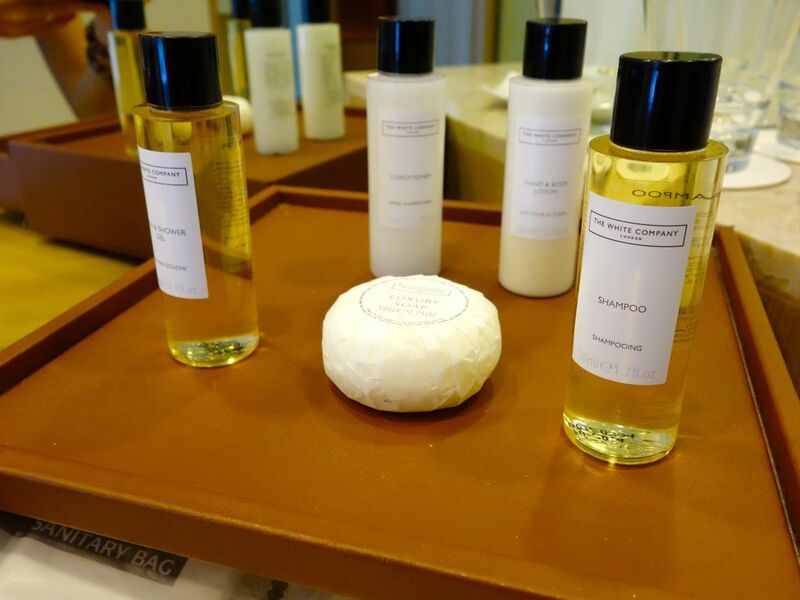 All your toiletries needs would be accommodated. Here is my favorite part of our suite. Pool access from our bedroom! 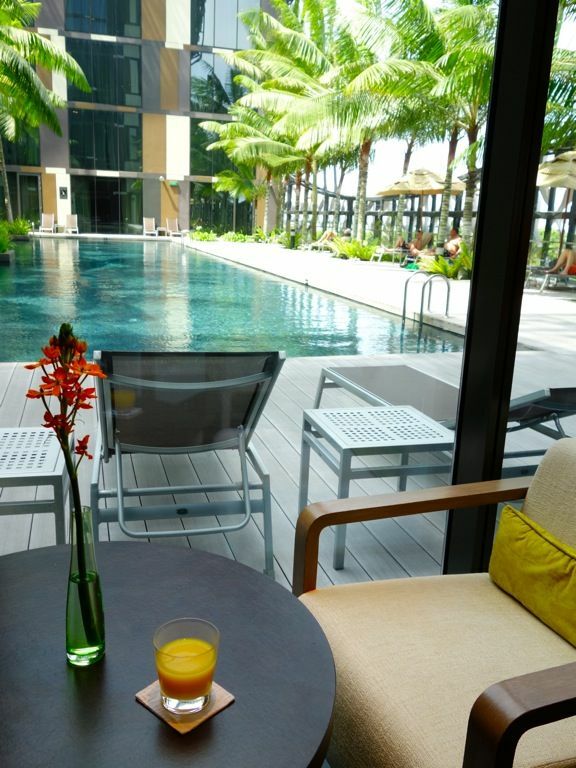 It walks straight out to the 30m landscaped outdoor swimming pool. From everywhere in the public areas, there is contact with lush gardens – including surprising views upwards to rainforest trees through a water covered skylight. I left S to take a short nap while i explored the hotel. 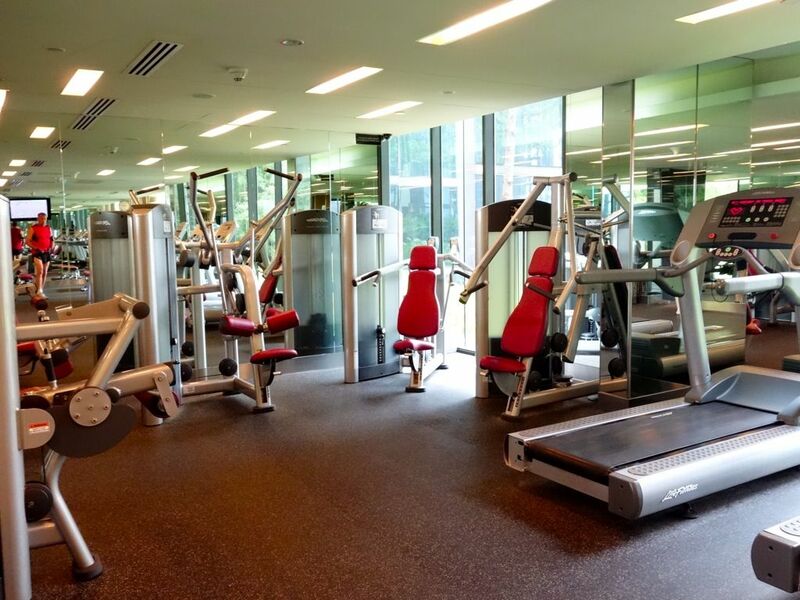 Here's the Crowne Plaza Club which is created exclusively for frequent business travelers with their personalized service and host of special privileges and amenities available daily from 6.30am to 11pm. 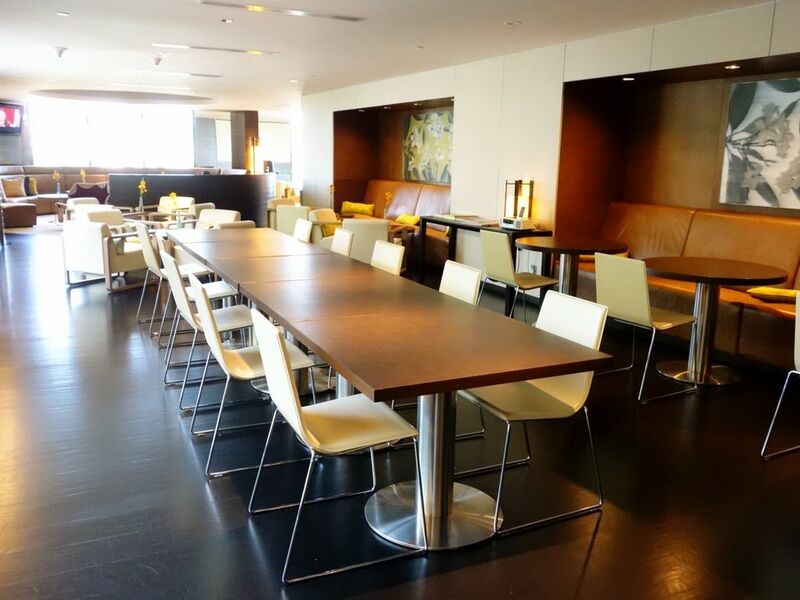 Business travelers could work from the Crowne Plaza Club Lounge comfortably. There are Internet workstation and meeting rooms for booking, as well as photocopying and faxing facilities. Complimentary WIFI access is also available. 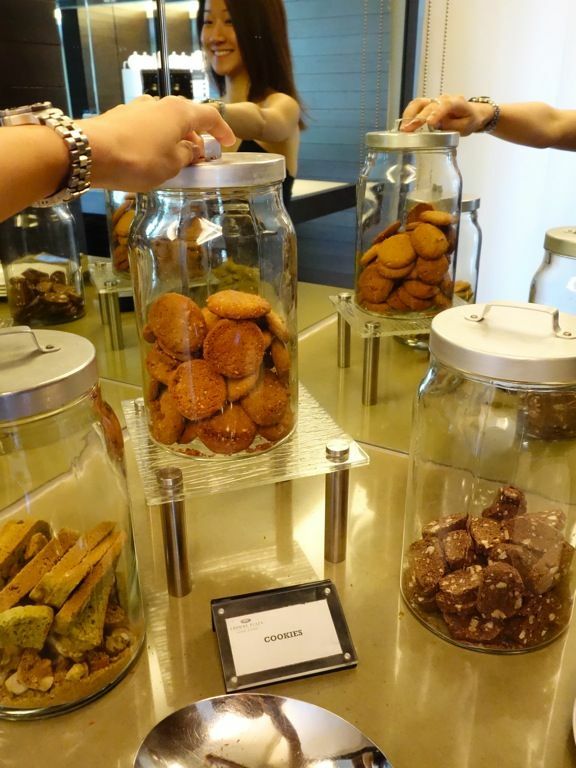 All day coffee, tea, juices, mineral water, soft drinks and a selection of cookies are available. Of course i helped myself to some cookies while waiting for S to hit the gym with me. Vitamin C ftw! Into the tummy, and onto my skin. The secret to staying slim is hard work at the gym. Squeezed in a heart pumping run and some yoga stretches at the small but adequate fitness center. Love how the machines are all so new and fancy. Always work on even when traveling i say! 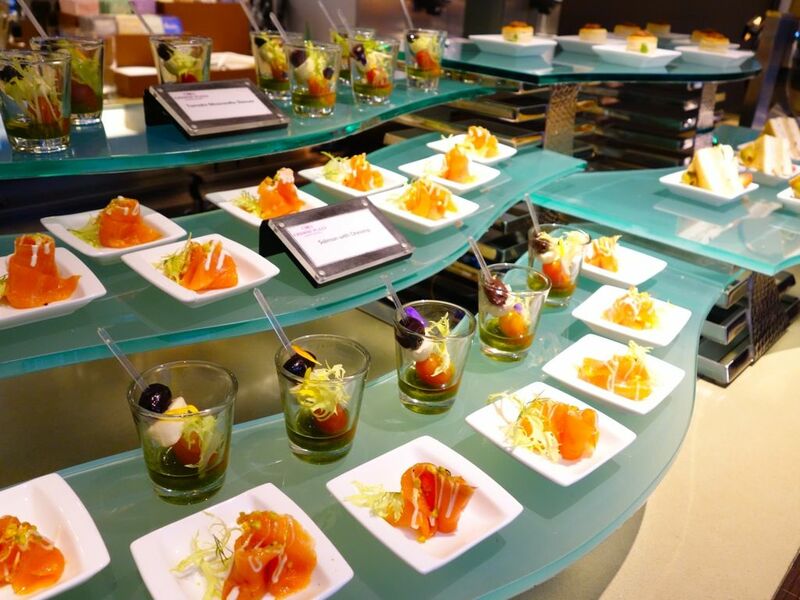 Another Club perk is the daily evening drinks and canapes from 5.30 to 7.30pm. They have my favorite Wensleydale Cranberry Cheese! Well for small tummies like mine, these are actually sufficient as a proper dinner. Mini sandwiches, puffs and dim sum, along with artisan toast and cheese and a good selection of desserts, you hardly need to eat after. 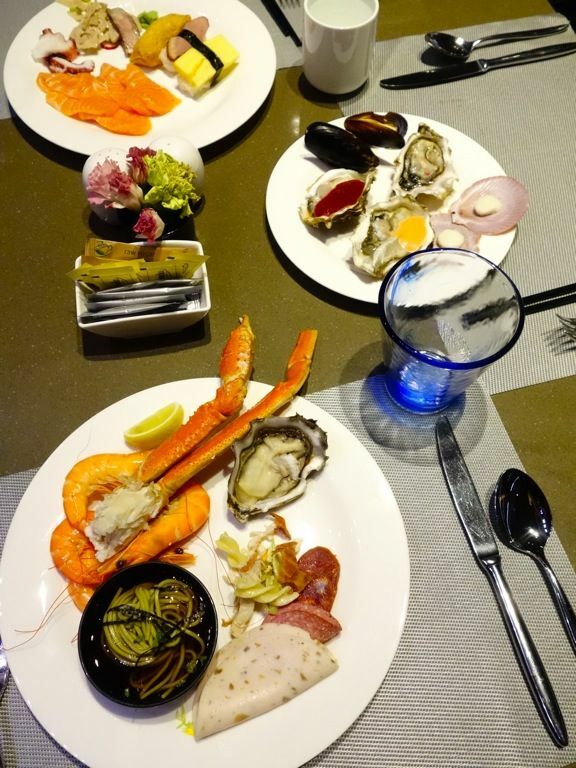 If you require a proper meal, there are several places you could eat at in Crowne Plaza Changi Airport. I would recommend Imperial Treasures for their consistently good chinese cuisine. For international fare, you may want to consider Azur, which provides buffet as well a la carte meals. Read my previous review of Azur here. We had the Black Angus Buffet which was their promotion then. Hits and misses. We preferred the fresh seafood section though. Lovely king and snow crabs. S made me shell all the prawns and crabs for him! I'm certainly very marriageable by Singaporean men standards. Hur hur. The plump oysters were really good too, probably Canadian or Australian. Morning rise and shine! Had a great night's rest and woke to breakfast served at the Club Lounge. They serve breakfast daily from 6.30am to 10.30am. The spread in the lounge is probably not as great as that at Azur (where we could have eaten breakfast at) but it's quieter at the Lounge and certainly more relaxing with the pool view. A perfectly portion controlled breakfast for Ms Skinnyfat. Adequate eggs, lovely mushroom ragout with zucchini, juicy sausages and my favorite cheese. Back to chilling out after breakfast. Planning the next travel while on vacation is my thing to do. Then it's the gym again and back to the bathtub. The Travelerintransit is always on the go really. I'm too Type A to stay still. Heh. 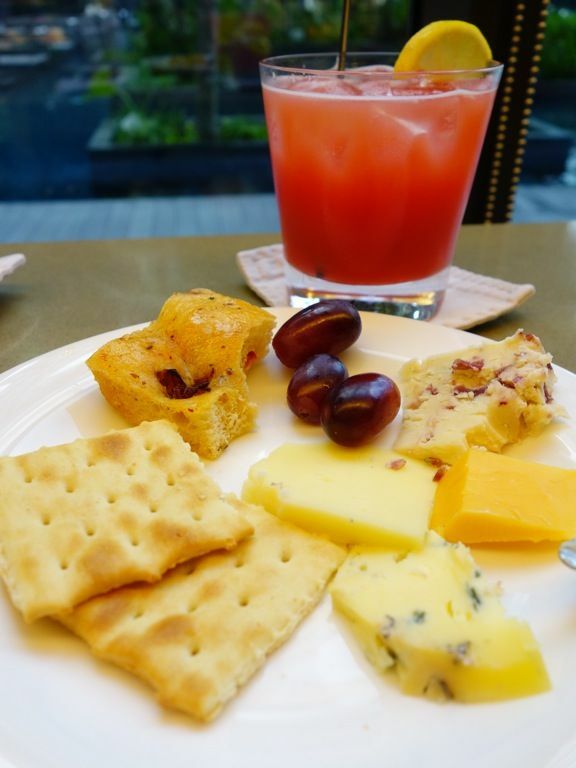 We really enjoyed our stay at Crowne Plaza Changi Airport and i was so reluctant to leave (i wouldn't mind leaving on a plane though). CP is currently having a Great Value Package till end Apr 2014 and it includes breakfast for 2, complimentary internet and $40 nett non-cumulative F&B credit for use in Azur, Lobby Lounge and bar '75 (not valid for in-room dining). You need to book your package 14 days in advance though and you can book it here at http://goo.gl/Mzh4ZR. Prices start from $290 and Club Access is an additional $100 per night. 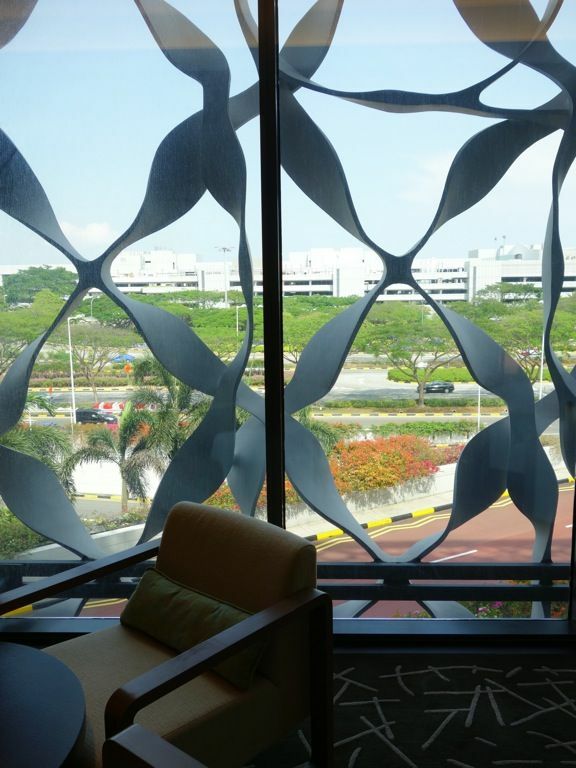 Thank you Crowne Plaza Changi Airport for this wonderful staycation! Till the next one.